I return now to an obscure mystery, mostly solved long ago but worth a re-explanation. 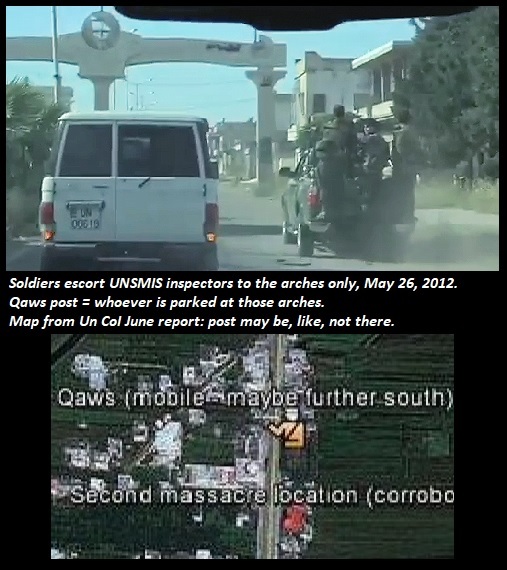 It casts doubt on two lodged witness accounts that are basically the same, re-packaged, and along the way ... does much more to help show how fictitious these "Houla Massacre survivors" the UN investigation chose to believe really are. This gets complicated. I'm following, but I'm not so sure the reader can. Please try. It's very interesting. Remember now the massacre victims were from 4 groups: The majority were named Abdulrazaq, a smaller Al-Sayed families, about the same from other assorted-name civilians, and fewer killed militants included (none of the killed soldiers or "Shabiha" were included). It turns out the other name people were mainly or all related by marriage to the al-Sayeds or mainly to the Abdulrazaqs (mostly as wives, but including some in-laws). 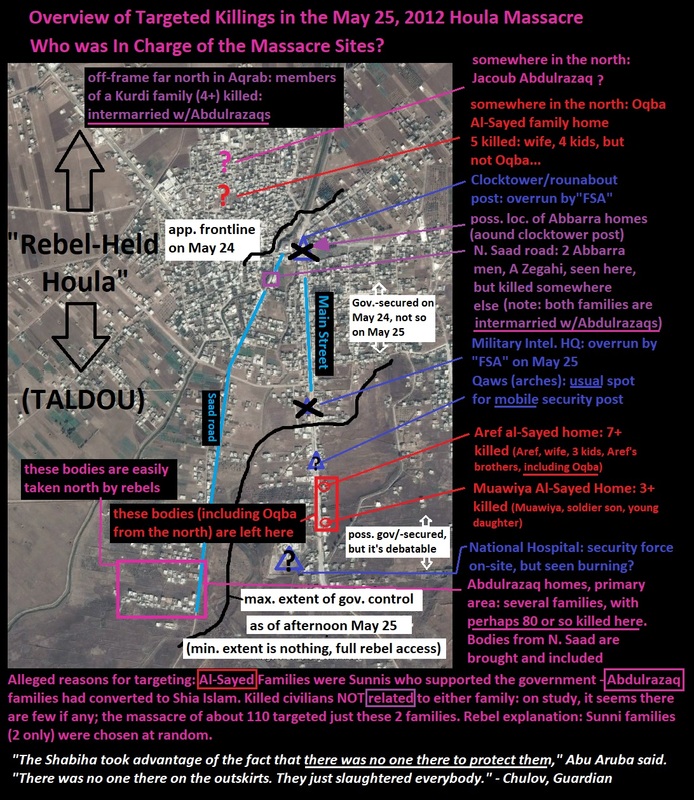 This targeting of two extended families is explained in the "Syrian government" version - the Sayeds were loyalist Sunnis and the Abdulrazaqs converted to Shia Islam. But it's not explained well in the opposition story where opposition Sunnis were picked at random from a town full of them. This is in fact far from random. This would suggest she's a daughter of a man named Ali (middle name) Al-Sayed. Conisder an incomplete listing per VDC: 94 Houla residents killed, plus these 6 Aqrab residents (that's a long and murky story I already covered here, and that we'll actual come back to in this post). There is an adult Ali Adel Al-Sayed listed as dying by the VDC, but not by anyone else (see comparative list ) That's likely a phantom entry resulting from some confusion, which there seems to be plenty of here. Also, Ali Adel Al-Sayed is the name given by another survivor, for both himself and his slain father, which makes no sense in at least two ways (he's clear on the family and site he refers to, and everyone else on both sides agrees the father was named Aref - and an Ali Adel would not name his son Ali Adel, usually - the other dead kids have Aref as middle names, per the norm). This is just one of many serious problems with this kid's accounts. He's pretty much the star witness for the opposition's Houla Massacre story, which is just to bad for that story. Here's Ali's 18-years-older phantom sister? He mentions no such sister, and she mentions no such kid surviving in her story. So no, this is some phantom confusion. - Somewhere in the rebel-held north-center of town was the Oqba Al-Sayed home: 5 killed (Oqba's wife Razeena Rajab Al-Sayed (changed names? that's odd) and 4 kids, but not Oqba, a "retired officer" of something per VDC...) - this spot is out of government reach, within rebel reach. 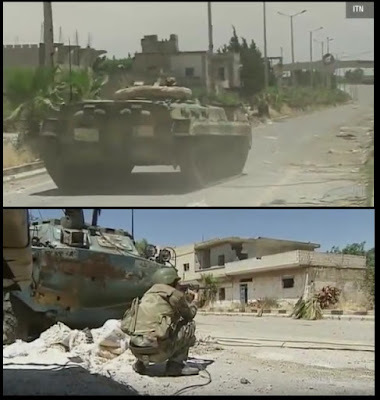 - On south Main street is the Aref Al-Sayed home: 7+ killed (Aref, wife Izdihar/Fairoz Ali Al-Daher, their 3 young kids, Aref's brother Oqba, brother/nephew Imad/Shaoqi) - access at this spot is debatable, but Oqba from the north wound up dead here. - Further south on Main street is the Muawiya Al-Sayed home: 3+ killed (Muawiya, retired police officer, his soldier son Mohamed (on leave, broken leg from the clashes), and 8-year old daughter Sara - a real wife and teen/adult daughter may be missing (killed but not acknowledged, to make room for fake survivors - or is that really them who talked to Der Spiegel?) - access at this spot is debatable. At both Main Street spots, bodies were not removed by oppo. that night, left behind for the army to find and SANA to show in the morning as victims of the terrorist attack in Taldou. A little more detail than needed in this graphic, but it helps map it out. We're dealing with the red locales here to start. But we'll follow Rasha's story into the magenta area and even through some of those purple related people. - Rasha Ali - crawled away from somewhere no one else has reported? Somewhere fake? Two different fake places with two versions of the same family? Rasha, whose family home is in the south of Taldou, told the UK Guardian: "We looked outside and saw the army checking houses in the neighbourhood. 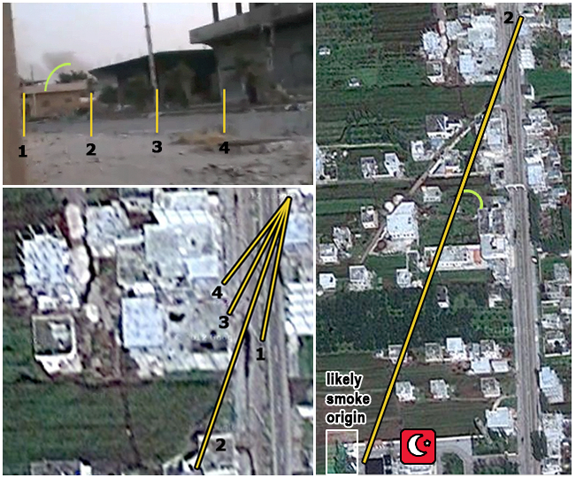 They were near the water plant and one of the tanks started firing on our neighbourhood. They were trying to give cover to soldiers who were starting to break into the houses." She fails to mention they would be holding back the FSA fighters also trying to gain access. Were there two armies competing to enter from different sides? If so, why does she ignore one, like all the other opposition witnesses? No ... there was only one attacking force, and she's either telling it right, or upside-down. Note: The water plant is the hilltop army post, off-frame on the graphic above to the lower right (southeast of town, but not far). 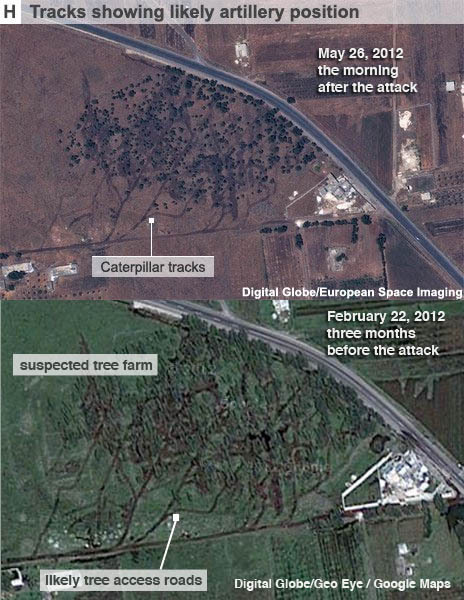 This is where shelling with tanks could come from. The Sayed homes on Main Street are a lot closer than the other homes. Her father answered a knock on the door, unconcerned, but it was Rasha who showed the soldiers her father's ID card proving he was a retired soldier. They didn't seem to care, pushed Rasha and four other women into a corner, beat her father and "shot him in front of us," she said. One explained this was "revenge for you, Imam Ali" (meaning they're Shi'a extremists killing Sunni enemies). She says they decided verbally to kill the children in front of their parents, and shot her in the chest. But she lived... By her story, there were 15+ people in this home, with 13+ killed (dad, mom, 4 sisters, aunt, 3+ ("all") brothers, sister in law, their baby, a neighbor). Survivors: Rasha, a one-month-old cousin who she found alive. Clues that she really means Al-Sayed: the retired soldier/officer part really says she means Al-Sayed, where 2/3 of the reported households were headed by retired officers of police and something... and I don't know of anyone in the Abdulrazaq sector with such a distinction. The mentioned closeness to the "water plant" army base supports that. Including "Ali" in her name also supports that. By age, Rasha is a best fit for Muawiya's home. The "revenge for Imam Ali" part would also make the most sense here (his name plays into that). He's an older man than the others, a retired police colonel, perhaps a soldier too at one point... he had a son Mohamed fighting in the SAA at age 22, I think, killed in the massacre (home on leave with a broken leg from the clashes). A 29-year-old daughter could fit here. But 3 people are reported as killed here, not 13. And alleged surviving daughter Maryam, age 19-ish by appearance, recalls how they forgot about 8-year-old Sara as she, mom, and a couple other relatives all fled. But she doesn't mention an older sister, and Rasha doesn't mention Maryam. Or maybe... another version of her mentions a sister AND a mother escaping ... see below. There's simply no room for Rasha in any of the 3 known Al-Sayed homes. And there's no room for a 4th one headed by a third retired officer named Ali, where some 13 people died and 2 escaped. Someone else would have reported that, and no one has. Is this an alternate attempt to explain the Al-Sayeds as all being in one home? 13+ is similar to tally to all the Sayed family members combined (at least 15, maybe a few more, records are confused). 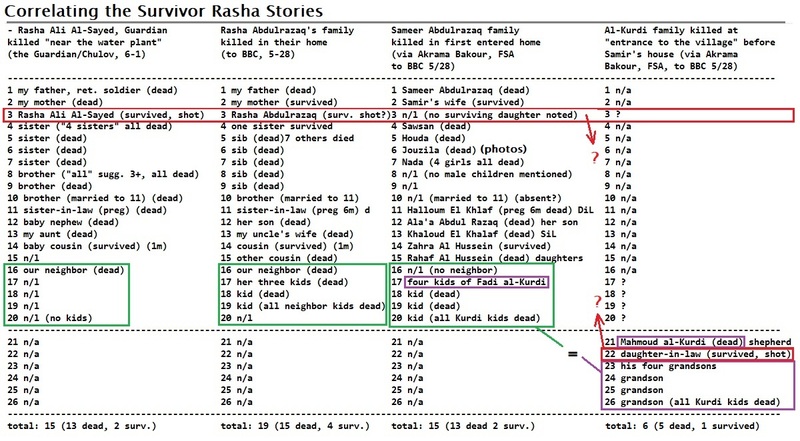 But this might be a coincidence; the gender breakdown of the victims is not eve a close match; Rasha's story has mostly females, both living and dying, while the Sayed segment is more balanced or even man-heavy. To find a workable similarity, we needs to cross the fields and the creek to where the bulk of the killings happened, in the Abdulrazaq homes. There we find a nearly perfect match. point-for-point across this detailed cast of characters. As the one who's been correlating stuff, I'll say this account matches no otherwise supported victim set. "Rasha's" Al-Sayed or Al-Sayed Ali family fell through the cracks, with no records for any such people. By size, it's about the same as the UN's "13-15" overall Al-Sayeds from 3 or more homes. But by details, it's no match for even that. With thirteen people killed in one house, a neighbor involved, a pregnant sister-in-law killed, and a weeks-old infants surviving, it sounds almost like the Rasha Abdulrazaq story transfered to an al-Sayed setting - and she is named Rasha. Via a May 28 BBC report, this similar Rasha said "We were about 15 people.... We were eight siblings, including myself (4 sisters, 3 brothers), and my sister-in-law and her son - she was also six months pregnant. With us as well were my father, my uncle's wife and her daughter, as well as our neighbor and her three kids." That's 18, the 3 kids added. "My aunt and her two daughters - one of them was only injured and she's here with me - she is one month old, the other one died." Is that the same uncle's wife? Presumably. But 2 daughters = 19 total, the baby one living, only one mentioned in her prior rundown. 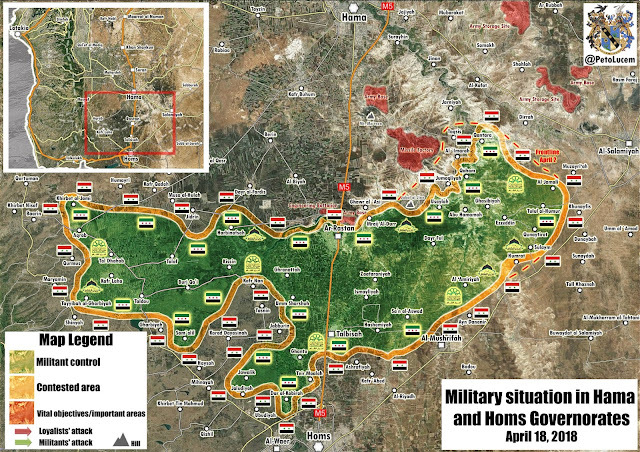 "We were all in the house" that should be over there on Saad road, further from the army base than Rasha Al-Sayed was. "I survived with my mother and the one-month-old girl and my sister. They shot at us but we survived." She also says everyone was hiding behind her mother. She's one of the few who lived, Allahu Akbar. She speaks to BBC and says "They thought I was dead. It was thanks to God that I survived. He was shooting my kids and yelling." This other and slightly earlier Rasha story could be exactly the same told to Chulov a few days later if: she changed the family name - added the retired soldier status for the dad (or didn't mention it at first) - had her mother and sister die instead of escaping with her and the baby - dropped the 3 kids of her neighbor and one cousin from her earlier tally of 19 in the house, for a total of 15 people - but still started out saying "about 15' - Kept the name Rasha (because it's her real name or one she really likes?). In neither version does she mention a husband or children, despite being 29 in one case, if not both. A surviving mother and daughter drop off her story radar as she switches families between 5-28 and 6-1. Were the actors re-assigned to be the survivors from Muawiya's home, for a total of three former Abdulrazaqs recycled into Al-Sayeds? That seems kind of likely. As the remaining Al-Sayed witnesses not analyzed to death, Hana and Maryam merit more scrutiny if time allows. At least they got put into a home that existed, and aren't as obviously fraudulent as little Ali. But Rasha here says she's miracle survivor Rasha Whatever, among 15 people or just the same type "plus I forget." but with two names and in two areas. Why? Poor planning, I suppose, some mix-up in the provided instructions - the kind of error that can happen when you're trying to manufacture realities. It's pretty uncommon among people telling the truth, but it happens a lot with opposition witnesses for regime crimes in Syria. This is an extra-bad, but not unprecedented example. And it gets worse. 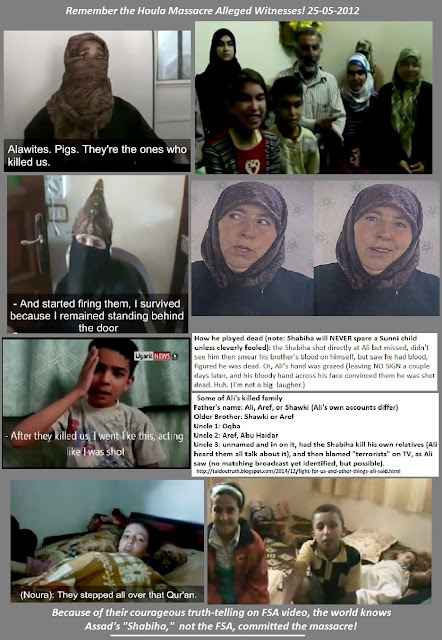 Is she Rasha Sameer Abdulrazaq, Wife of Fadi Al-Kurdi? Rasha says her father was shot right in the chin. Sameer Abdulrazaq was not shot in the chin according to 2014 morgue photos (report link below). No men that I can see were. 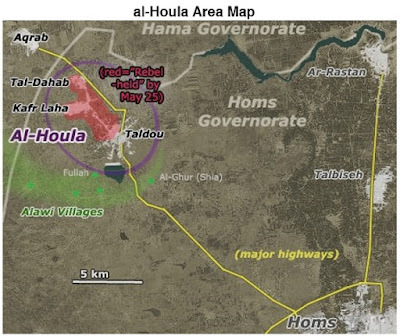 And as Akrama Bakour of the FSA related Sameer's family to the BBC in the same May 28 report, there's no room for Rasha. Still, this must be the family she refers to. The disconnect is fascinating. Here one final cluster of confusion tackled at once in a big table. With a little poring I think I have this partly decoded, but riddles are still emerging, the more I look. But the more you go over this the clearer it is this is the same batch of people related three different ways. Note how the BBC got Rasha's story and Bakour's story writing her out reported at the same time. Did they notice the bizarre contrast? Also considered is Bakour's story of another set of people named Al-Kurdi killed right before Samir's house. Note how Bakour names the neighbor kids Kurdi, father Fadi. 4, not 3, and gender unclear. Turns out Fadi Mahmoud al-Kurdi (their dad) is likely the son of Mahmoud Omar Al-Kurdi, the shepherd who happened to be killed nearby. So these 4 "grandsons" are double-listed. These are the also Aqrab residents: The 2014 Morgue photos report includes "91- Mahmoud Omer Al-kurdi, 45 years old, father, he was resident of Aqrab village and lived in place where massacred happened. (no picture)" So ... the massacre happened partly in Aqrab? 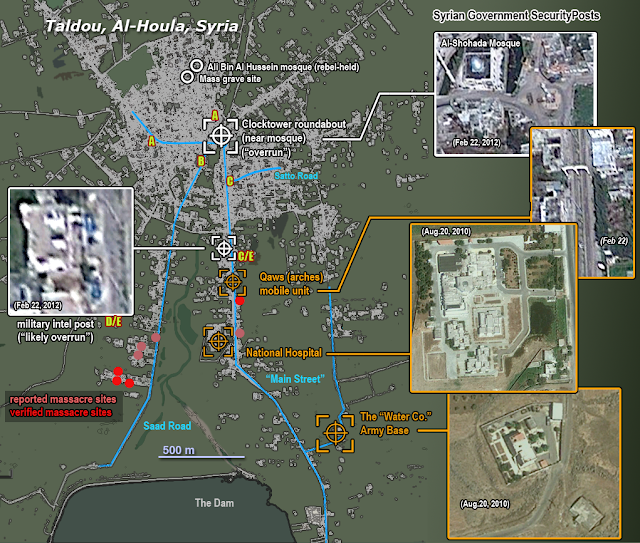 Other sources say yes, and tortured there, by "Shabiha." (see added comment here.) Bakour says he and the others were just near the "entrance" of Taldou. But the kids were also IN the house... The VDC lists the Kurdi kids as from Aqrab. They and others also list Mahmoud's wife, Zainab Arouq (reported alive at first, dead elsewhere). Mahmoud was in or near the home or whatever - he's included in this just like his grandkids and their mother. The 4 grandkids are usually listed a 3 boys, or 2 boys and a girl (2014 morgue photos report) or, altogether, 3 boys and a girl: Mahmoud (named for Grandpa), Omar, Mohamed (baby), and Zeynab (named for grandma). All names are followed by Fadi Al-Kurdi. The gender-number-unclear neighbor "kids" sound kind of like the same, even without the these other correlating clues. The mother of 3 who died becomes the mother of 4 who survived. In no version is she given a name, but in Bakour's version, she survived the shots. Keep that in mind. The coup d'grace: note there is no surviving daughter for Samir when there clearly should be. There are no sons mentioned, and just 4 daughters, all dead. The morgue photos used for this 2014 report includes all 4, dead in photos and just like Bakour says, along with dad and no sons shown or named (suggesting she lived - according to the people making that list). But Rasha's direct stories have an implied three brothers, but always unnamed. And the one 6-months pregnant daughter-in-law is there, with baby, dead. Aunt dead, two daughters, one surviving. Mom survived. This is all agreed and sounds like the same household, in slightly different versions; Rasha Abdulrazaq's home was Sameer Abdulrazaq's home. One surviving sister is disagreed between Rasha and Bakour, besides Rasha herself, and her brothers. And also where's the neighbor lady who died, the mother of those kids? The brother's don't appear, but Rasha might. Even as Bakour writes her out, he seems to write her right back in, in a difretent role. The mother of the Kurdi kids in his house survived. Like Rasha, she was shot (but perhaps not in the same area/s, as claimed with no visuals: he says thigh and belly, while Rasha said chest). Bakour says this didn't happen in the home, but whatever. This mystery woman is the daughter-IN-LAW of the elder Kurdi, so the DAUGHTER of ... Sameer Abdulrazaq, perhaps? 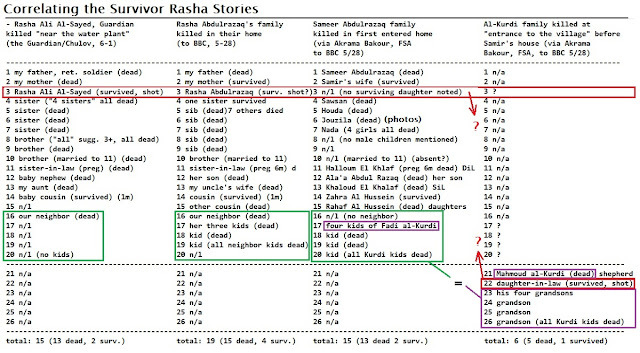 If so, Rasha is the same person as the un-named surviving mother of the Kurdi kids in Bakour's version. She's the link between one targeted section and another, and with murders way up in Aqrab. 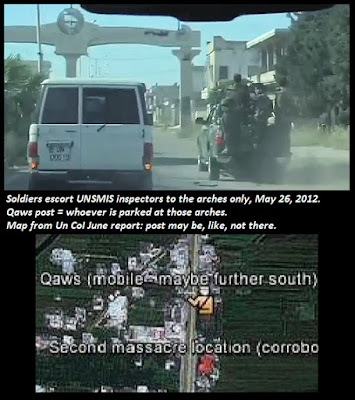 (Aqrab was government-held, but Islamist parties were present, and would be capable of abducting people here and there). If so, both of Rasha's own version would have her calling herself a dead, unnamed neighbor, and ignoring her own kids in the version where she was an Al-Sayed. Considering the general malleability of this record so far, this isn't outlandish at all. We could safely say those aren't her kids, that wasn't her in any role in any of those fake stories. 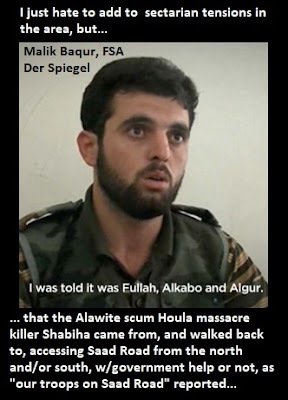 Is this witness Rasha Sameer Abdulrazaq, wife of Fadi Al-Kurdi? No. But someone was. When she was just a neighbor, she was reported dead. She likely did not survive, and is either listed as one of the couple unplaced female victims, or was left off the lists. Or perhaps the killers spared that real woman for some other fate in secret captivity. This happens with unknown frequency. But either way, she won't be left around, and that's a blank spot someone filled with this impostor, Rasha Whatever. Rasha wouldn't be THE link to the Kurdi familiy anyway, just one of three. FSA's Akrama Bakour reported 2 women named Khalaf killed: Khaloud was Samir's sister-in-law (married his brother). Haloum married one of his sons, was the mother of a young boy and pregnant with another. So one brother married one Khalaf, and a son married another. 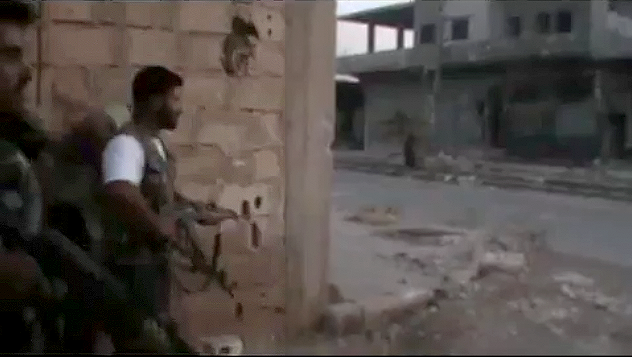 Haloum (no picture) appears in the 2014 list as the killed mother in the Alaa Sameer Abed Al-Razaq family. Alaa is not listed as killed, but he'll be the married brother Rasha claims dead along with 2 other brothers that Bakour and others (like the people making the list) deny or ignore. Their baby son would not be named Alaa as usually given - it would be his middle name. In fact, by this, he was named for grandpa: Sameer Alaa Abed Al-razaq, 2 years old, son. Khaloud Al-Kurdi is listed by the VDC and by early Arabic lists, but is not included in the 2014 morgue photos list. Her daughter Rahaf who died is likewise listed everywhere but that 2014 list. So a brother, a son, and a daughter of Samir each married someone named Al-Kurdi, and this was variously scrambled, with people left off and one explicitly replaced with an imposter. BTW Samir's own wife who allegedly lived is never named. Is she a Kurdi too? This isn't a major point, but I suspect it's an error; Husein being a middle name taken as last because the last name was left off. Even the VDC entry could be explained by that; fuller names may include father's middle name as well, for 4 names. In fact I propose she was named Rahaf Mohamed Hussein Abdulrazaq, daughter of Mohamed Hussein Abdulrazaq. Checking … that's his brother's middle name: 15- Sameer Houseen Abed Al-razaq, 45 years old, father. So that's a really good guess, and Hussein mystery seems solved. This article so far is short on images - none showing this Rasha have been clearly matched but … there's a video analyzed at ACLOS. 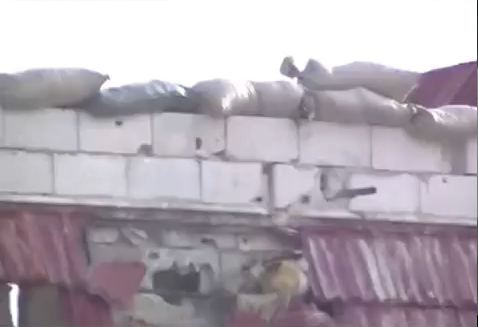 If this is another example in the series (seems likely), it's likely the earliest: filmed by frontline FSA activists (acomplices to any terrorist crimes like mass murder or kidnapping), likely the day after, May 26. (checking: they give May 27 - still earlier than either account above on 5-28 and 6-1). By my notes, mostly from the provided English subtitles, there were 5 females appearing as survivors of what might be 2 seperate massacre sites, or one - the clues are mixed. I considered it an unclear line-up, but on reflection, I think this is part of the same effort to explain about 1/5 of the Abdulrazaq victims with one most-told story, and the differences are from this being a first-run they improved over the following days. - 7 out of of 8 siblings (9 total, one more than Rasha would claim). 7 sisters and her one brother. Only she lived. No one else is mentioned, but it's a brief account. Was the one brother married? She thanks the FSA for coming along soon after the massacre to save her, otherwise she too would be dead now. Asked if the government claims that "armed gangs" did this, she swears "That's a lie. They're all Shabiha pieces of sh*t. They're Assad's men." 2) A pregnant woman is in the bed with her, also set for donating blood, if not draining yet (unclear). 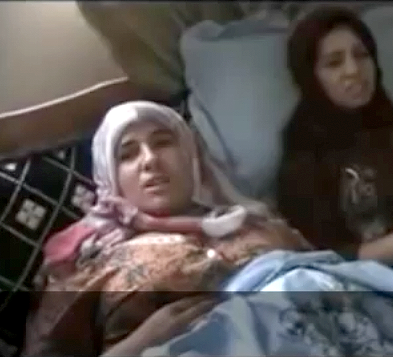 At 2:10 she's demanding the regime's fall, no matter how long, no matter how many women and children have to die first. To emphasize the point, she refers to the baby there with her: "like this baby girl. What did she do to deserve this, to die at one and a half months old?" (She didn't die, yet. Possible mistranslation.) At 2:22 she tells her story: "I was standing at the door to my room. I'd only been married for four months. The baby I'm carrying would have been killed along with me." That's it, except "the only one who has any weapons is that pig Bashar! And his army and Shabbiha." Here the pregnant sister-in-law Haloum al-Kurdi survived along with Rasha, likewise suffering a wound? 3) the infant, said 1.5 months old, also draining blood from her tiny abdomen into a collection canister. How can that not be Zahra al-Hussein? Were there two 1.5-month old girls who each survived a massacre in two out of something like 9 or 10 targeted homes in the same area? The salafist cameraman says her mother, father, and brothers were all killed, which wouldn't be correct (just mother and one sister) but he might just mean orphan, lost whoever. He asks us "is she a terrorist? Does she have an RPG? What kind of people would do this, other than Assad's Shabiha? No gang in the world is more criminal, more shameless than Assad's." "There were 12 people in the house and they killed them all. This is my sister's baby daughter. They killed her mother, but my niece survived." 12 killed in a house, perhaps with a pregnant woman, a surviving 1.5 month old girl... If 12 killed, 2-5 of these females surviving, it's a 15-17 member household - compared to a 15-19-member one at Samir's, with 2-4 surviving females. - "I watched them beat my husband in the head until his brains spilled out. 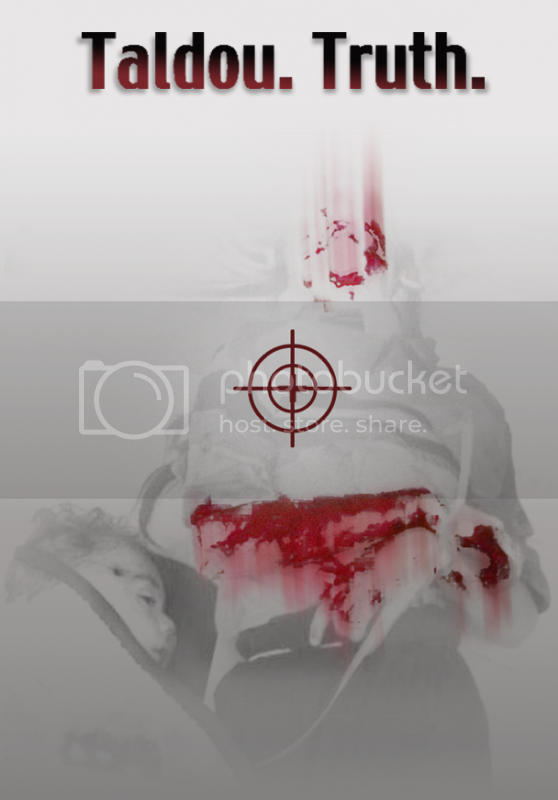 After that, they shot him." - "They were all killed. They thought I was dead. That's what spared me, and let me get out alive." Compare to Rasha Abdulrazaq's mother: "They thought I was dead. It was thanks to God that I survived." 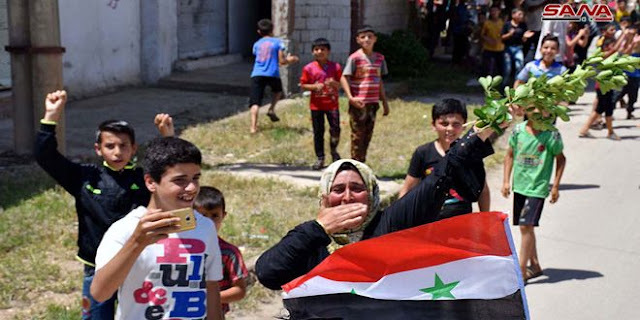 - commentary: "Alawites. Pigs. 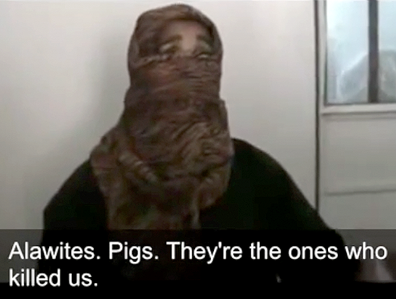 They're the ones who killed us." A quoted cheer: "with these guns we killed a hundred, oh Ali!" That's all remarkably similar to the unnamed wife of Samir Abdulrazaq, survived version, likely Al-Kurdi version too (for 4 points of intermarriage if so). (And again, this would be someone probably posing as this wife, who gets reported dead anyway half the time. She could have a different actress for every interview. But the script remains mostly the same each time... same goes for the person most like Rasha here, who looks younger than the 29 claimed by "Rasha Al Sayed Ali," who later told the same basic story. 5) Another niece (unnamed): At 3:52 the aunt briefly pauses between explaining her own survival and swearing to God about all of it, to address a little yellow-clad imp standing patiently behind her. "...and this little girl, my niece, was hiding among the bedding." (Possibly Rasha's surviving sister? Just an improvised add-on not worth correlating? Another coincidence of two eerily similar stories? 5 in this group alone, plus the 2-4 females from Samir's house, be that one scene or two,. plus the others like Ali, Abu Firas, etc. makes this attempted liquidation look rather sloppy as well as self-demonizing.